This Paramount film has the kind of outlandish plot often found in minor studio cheapies of the same period: Phillip Terry’s sister (Ellen Drew) foolishly falls for a gangster and ends up sold into “white slavery.” Her brother tries to rescue her but ends up getting framed for murder by the mobsters. 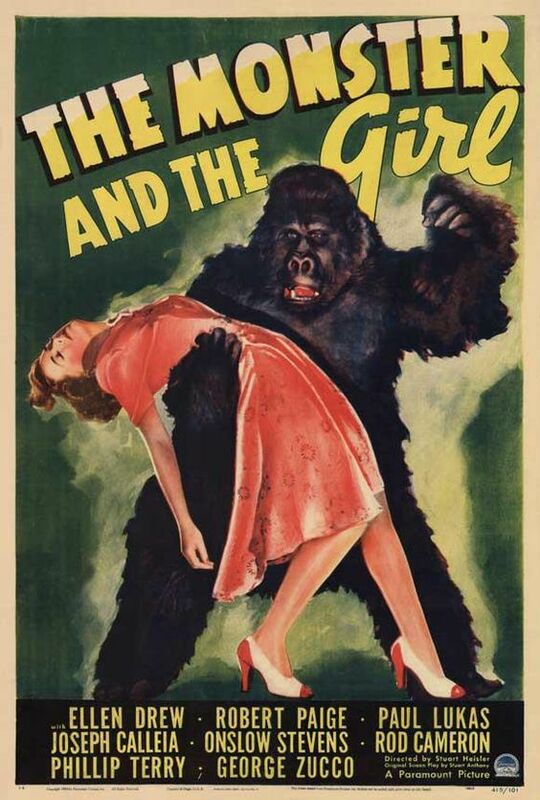 Convicted and sent to die in the electric chair, his body ends up stolen by mad scientist George Zucco, who puts his brain in the body of a gorilla. The gorilla now with Phillip Terrys brain, escapes and proceeds to kill off the mobsters one by one. Along the way his dog instinctively knows the gorilla is his (hers?) old master and tags along on his murderous rampage of vengeance. If one view this film ignoring the outlandish plot, this actually a very well made film with good Paramount production values, good stylish direction by Stuart Heisler, good atmospheric photography, and good performances by most of the films cast. Charlie Gemora’s gorilla costume is more realistic looking than the cheesy moth eaten suits worn by George Barrows or Ray Corrigan in minor studio pictures. Also Gemora manages express real feelings and emotions underneath that gorilla suit. Also Gemora’s gorilla actually walks and gestures like a real gorilla. THE MONSTER AND THE GIRL is an incredible film and is recommend if you are looking for something really outlandish but not trashy.